I attended a wedding two weeks ago and was seated beside a man in his eighties who admitted to me that he had never found his passion and had stayed in a career that he did not enjoy. This made me very sad because I knew that this was not unusual. I’ve had clients who have said the same thing. I too have stayed in jobs that I did not enjoy because I believed it was for the best, or I felt that I couldn’t do anything else at the time that would provide as much, or more, money. Yet as I look back on those times I acknowledge that I didn’t stay in those jobs for very long and that during the times I was felt “stuck” in a job I looked for opportunities to express my passion through my hobbies and through my social interactions. Even now as I make my career as a coach, I have not let go of my many passions, one of which is wine appreciation and education. Last year I pursued a dream of getting a sommelier certification. I went out to California for an intensive week-long course that culminated in a very challenging blind wine tasting. I managed to pass this test on my first attempt and I’m not sure how I did it. Actually, I do know how I did it. I prepared extensively ahead of this week of instruction in California by attending every free and cheap wine tasting I could find. I educated my palate tasting wines I had never been exposed to before: wines from Austria, Tasmania, and Croatia. And on the morning of my exam I arranged to have one of my peer coaches do a session with me where he invited me to visualize and feel a successful outcome. He reminded me that my mind was a file cabinet and that every piece of information I have read or assimilated over the many years of wine tasting would be readily available to me as if I was opening up a file cabinet filled with archival information. This was just the thing I needed as I nervously sat down for a timed, written test and one of the toughest blind tastings I’ve ever experienced. When the exam was finished my fellow sommelier wanna-bes and I paced the hallways waiting for our exam results which were promised to us that evening but instead we got word that the test results would not be forthcoming and that we would have to go home without knowing whether or not we had passed. Three weeks later I was informed by e-mail that I had passed the exam. 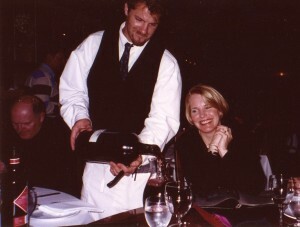 I was delighted that I was able to accomplish this and be granted the Advanced Sommelier certification. Through this experience, I learned so much that will enhance my enjoyment and appreciation of wine. Today I am planning a wine trip to Spain. I go back to the notes I made in sommelier class and I recall all the wonderful Spanish wines I have had the privilege to taste.